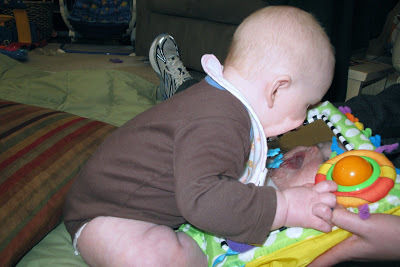 Babies are especially fun when they start noticing themselves + things around them. At 6 months old, that’s my nephew Jaxson these days. Learning the joys of sitting up, he slobbered all over that mirror + loved every minute of it! 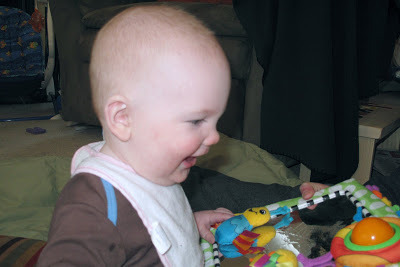 6 months is so much fun – you really get to see their little personalities come alive!! I’m totally the 1st born child, with those traits you listed!! wonder if cade will be like that too?? and I remember 1997 so clearly as well – I was in the same place myself… didn’t go quite so far away – just an hour, but those same feelings nonetheless – and you write so well!! umm, but not a single pic of your sis!?!?!? I can’t believe he’s 6 months old already! He looks just like Milla, I think!